In the area of the low Californie, located in the middle of city centre and greenery, in the heart of a premium residential area on hills close to the sea (at the edge of la Californie), magnificent 4-room apartment of 115.36 sqm CL enjoying stunning and panoramic views of the Bay of Cannes, the Lerins Islands through the Esterel hills and overlooking the city until the snowy mountains during winter time Located on a high floor, the apartment is composed of an entrance hall, a double living area with half open-plan highly fitted kitchen, guest toilets, a spacious Master bedroom with bathroom and dressing room en-suites and also two other bedrooms with shower room for each. The main terrace of 24.18 sqm is south west exposed. 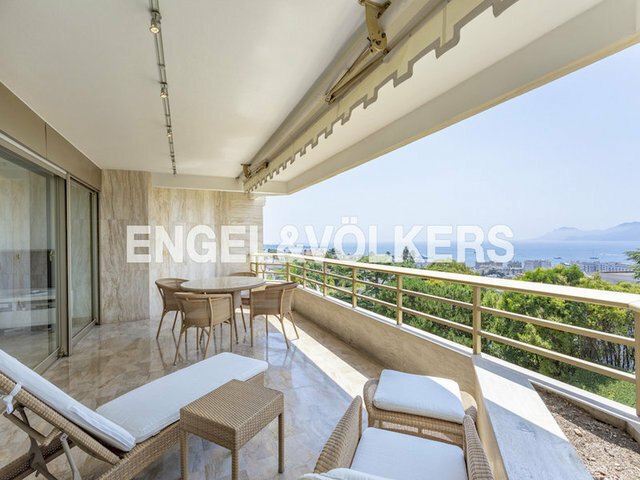 At the back are located 2 balconies of 4.53 and 2.66 sqm (than can be turned into a loggia). High quality services. An underground closed garage, that can directly by accessed by an elevator and also a large cellar complete this property. The residence, guarded and secured 24/7 days, provides a park and an indoor heated pool all year long. The city centre of Cannes is at only 6 minutes walking distance. A premium property perfect as a secondary residence or to live in all year long.